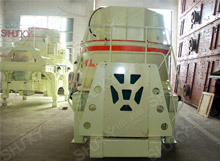 Shanghai Shunky Machinery Co.,ltd is a famous manufacturer of crushing and screening equipments in China. We can provide many kinds of crushers, including Jaw Crusher, Cone Crusher, Impact Crusher, VSI Sand Making Machine, vibrating screen and attched machines. Also complete set of fixed and portable crushing plant. What we provide is not just the high value-added products, but also the first class service team and problems solution suggestions. Our crushers are widely used in the fundamental construction projects. The complete crushing plants are exported to Russia, Mongolia, Middle Asia, Africa and other regions around the world. We have many crusher experts who are capable of new products searching and developing. To keep the development pace, we pay much attention on the talents introduction and international management ideas. We have a professional service team for our customers’ profit. We have built the complete recruitment and training system from 2001. Nowadays, we have college staff more than 70%. Shanghai Sunky holds the idea of “Quality Achieves Perfection”. We will open up an era of mining machinery with passion and exertion.